...And with it, the eventual return of peach leaf curl in 2013. Peach leaf curl causes leaves of peaches and nectarines to discolor, thicken, pucker, curl, distort and eventually fall off. The fungus overwinters in these trees as spores, usually in the new buds. The rains of late winter and early spring 2012 splashed these spores onto the emerging leaves, causing more problems. Emerging shoots can die; fruit production can be reduced in severe infestations. 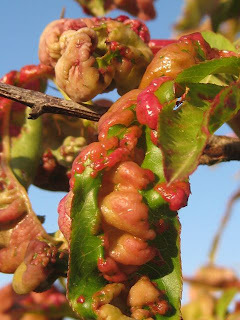 Only rarely do reddish, wrinkled areas develop on fruit surfaces; later in the season these infected areas become corky and tend to crack. 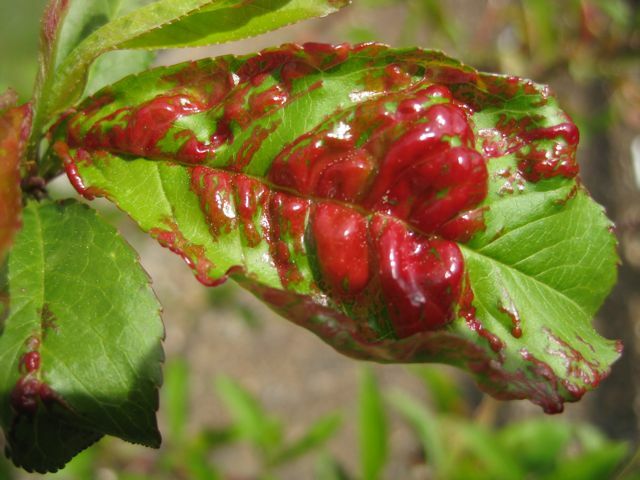 Studies at UC Davis have shown that nipping off infected leaves of peach and nectarine trees doesn't do much good. 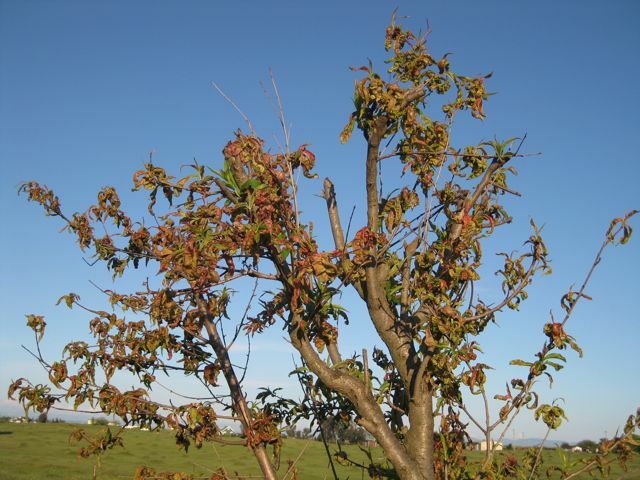 The best thing you can do this fall and winter is to assist those trees through this stressful period. • After cleanup, spread four inches of fresh organic mulch beneath those fruit trees. Organic mulches, such as compost, shredded branches or the fallen leaves of healthy shrubs and trees will help conserve soil moisture, hold down weeds and add nutrients to the soil as that mulch breaks down. • If leaf curl symptoms occurred on your trees last spring, be sure to treat them now to prevent more serious losses the following year. And to add insult to injury: tests conducted at the Fair Oaks Horticulture Center by Chuck Ingels, UC Farm Advisor, show that the older, stronger copper sprays that are no longer available (Microcop, for example), along with lime sulfur, did provide the best control. No matter which spray method you choose, several days of dry weather must follow for the products to work. And that was the frustrating part of the winter of 2011-2012: the weather was comparatively dry during December, January and February...perfect for spray applications. 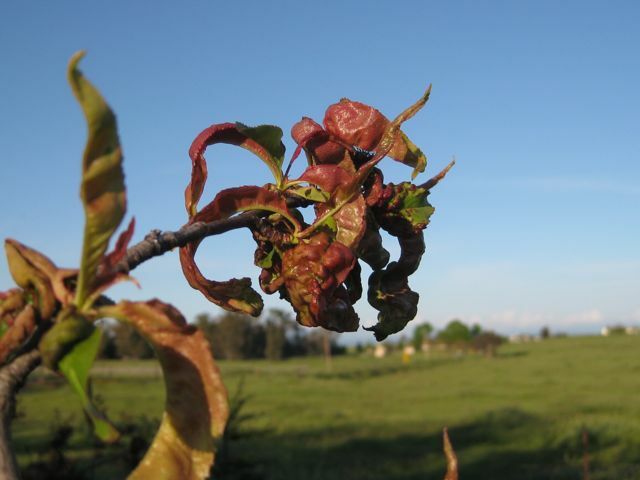 The wet March and April provided the perfect vector for peach leaf curl, splashing spores of the disease to those branches that were unsprayed or incompletely sprayed. 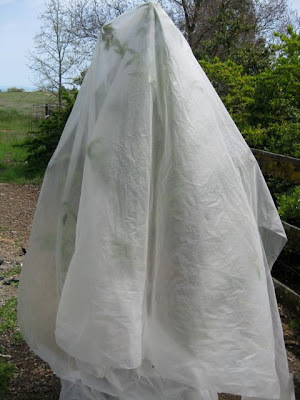 And for those who want to provide a helping hand next fall and winter to their suffering peach and nectarine trees: there's always spraying Liquicop combined with a spreader-sticker, followed by covering the trees with a row cover such as Agribon or other medium weight row cover fabric during rainy weather. Be sure to remove any covers during sunny weather to avoid overheating problems. Ingels does pass along this tip: "Agribon likely allowed some rain to penetrate to the branches. It may be best held up with a post in the middle to allow rain to run off down the sloped sides rather than having a flat surface on top, but it must be fastened securely because of strong winds."